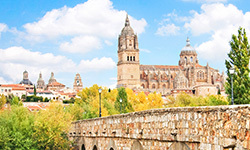 Earn up to 8 credits when you study with AIFS in Salamanca, Spain. You may choose to Live in a student apartment, or select a homestay or the student residence for a fee. Enjoy cultural activities like guided city walks, Spanish cooking classes, museum visits, a tapas tour, and intercambios with Spanish students. Depending on the Session, day trips can include visits to Madrid, Segovia and Avila, and Mogarraz, La Alberca and Riomalo. An optional trip to Portugal is also available for Sessions 2 and 3.